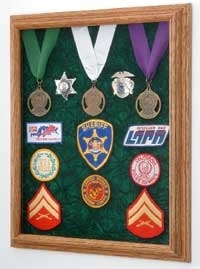 How about a Military Deluxe Awards Case Medal Frame from Flag Connections? Whether it's a retirement gift, something to surprise him with when he's home on leave, gift for graduation or birthday, or even achievements in sporting events and tournaments, they'll always be surprised with a handsome Deluxe Awards Case, available in different styles for all five branches of the military; Navy, Marines, Air Force, Army and Coast Guard. At Flag Connections, we stock only the highest quality frame and shadow boxes, as your loved one in uniform deserves only the best. 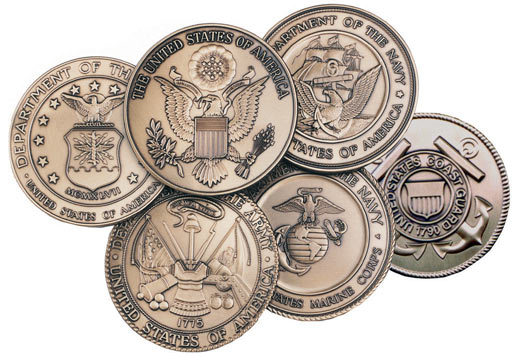 Each bevel cut frame stores a photo and a beautiful die-cast gold plated medallion designating which branch of the United States Armed Forces your loved one served in, displayed in the center right of the case. Each Deluxe Awards Case shadow box case also comes with an embossed 2 1/2” emblem. The frame's outer dimensions are 16” W X 20” H, making them perfect for hanging up to four award medallion necklaces, and keeping them in the same pristine quality as the day they were first awarded. Let your loved one serving in the armed forces know how proud you are of them and their proud military careers! Let the world know! The Deluxe Awards Case makes an elegant and truly patriotic decoration for all homes and offices who have a loved one in the U.S. armed services. The shadow boxes are double matted against a wooden frame bevel cut, colored with rich solid mahogany. In addition, line by line personalized black letters on brass engravings are available to extend your words of congratulations and thanks, as well as their titles of honor, awards bestowed, and dates of military service. Each Deluxe Awards Case comes with its own hardware for wall mounting and installation as well as a handsome wooden easel for desktop and workplace displays. All of Flag Connections' Deluxe Awards Cases are American made in the USA with the most top quality craftsmanship. The Military Medal and Photo Frame Shadow Box is a must for all veterans and their families. Not only for military veterans – buy the Deluxe Awards Case by Flag Connections to commemorate and show your gratitude and patriotism to all our heroes serving in uniform at home – active duty and retired police men and firefighters. Show them what their accomplishments really mean to you! Show them you care with a Deluxe Awards Case! Orders for thr Awards Display Case are usually shipped out within one business day to places within the USA and Canada.